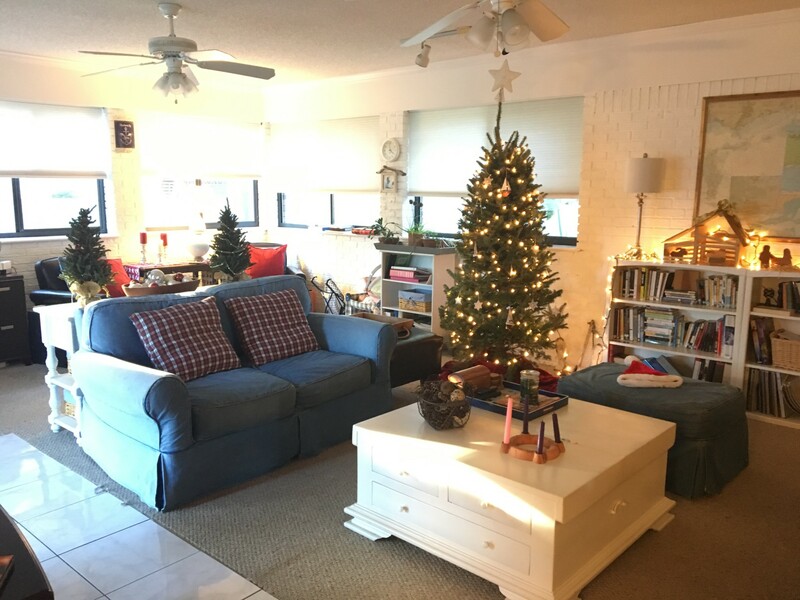 The Blended Blog is hosting a Christmas Home Tour! 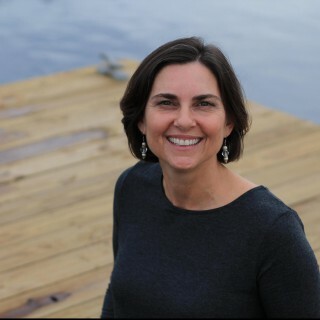 If you are coming from Whitney’s blog, welcome! Come on in! We’ll start the tour at the front of the house. As you approach the front door you are greeted with the smell of pine from the fresh pine garland. We get our tree from Lowe’s. They have a large bin where they throw the tree trimmings which are free for the taking. I use them to make garlands, swags or wreaths. 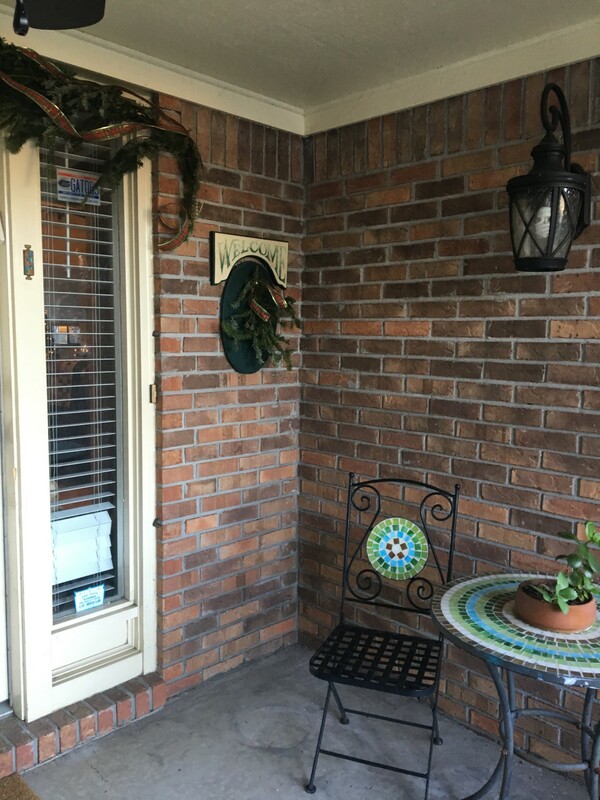 I hung a swag from the welcome sign and draped a garland over the door. It smells so good when you come to the door! Love fresh garland! 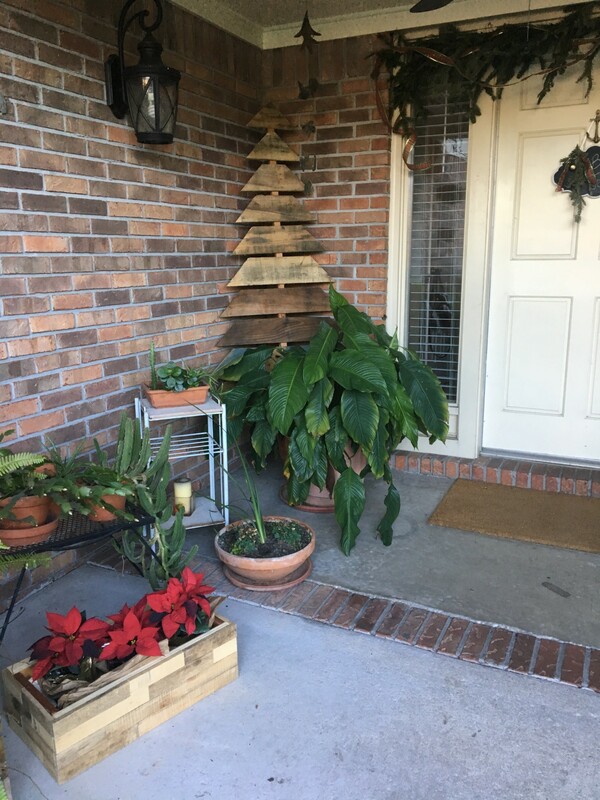 My dad made this pallet tree and planter for me last year. I love how rustic it looks. I got the little chalk board from the Target dollar spot in the spring. I have used it so much! I hang it from the anchor door knocker we received as a wedding gift. 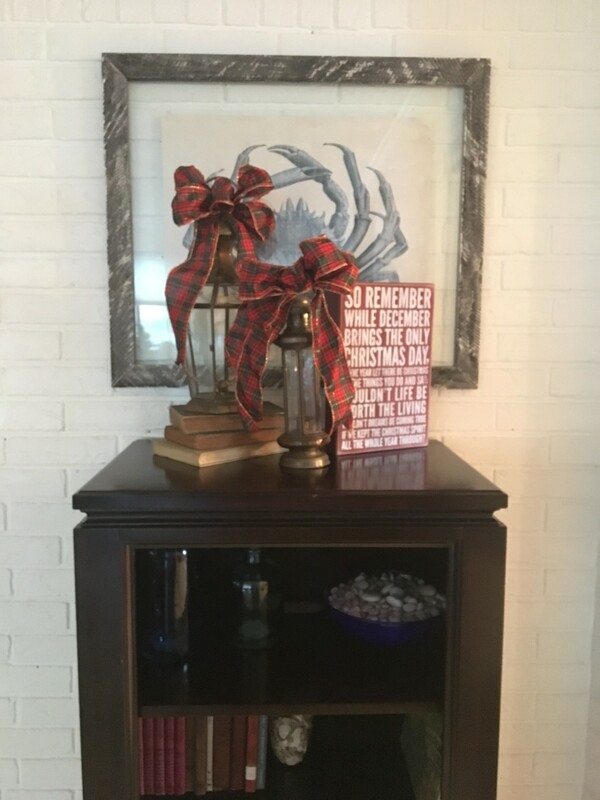 As you enter the foyer, the little table is decked with a Christmas basket containing our cards, a wooden nativity carved in Africa but bought at our church when a missionary was visiting and a hand-painted bowl made by a long-ago friend. From the foyer you pass into the fireplace room. 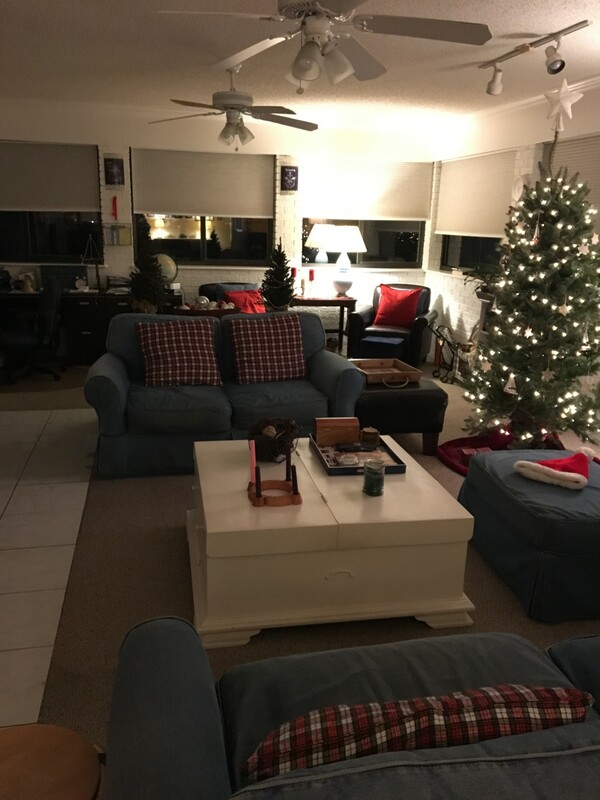 I had to rearrange some furniture in here to make room for the recliner that came out of the family room to make room for the tree. Remember that white cabinet? I still love it. It is sporting some of my milk glass collection. 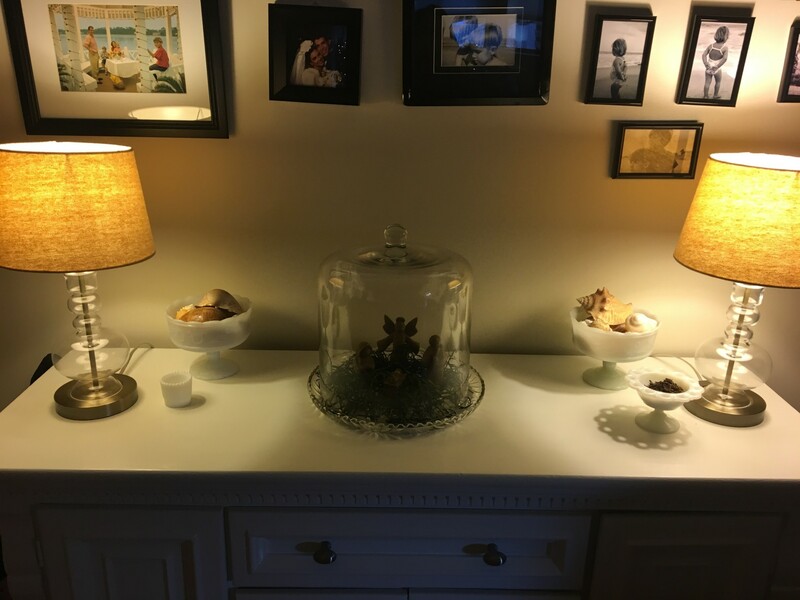 I got the large cake dome from Ballard Designs a few months ago. I added a small nativity under it with some green straw for grass. 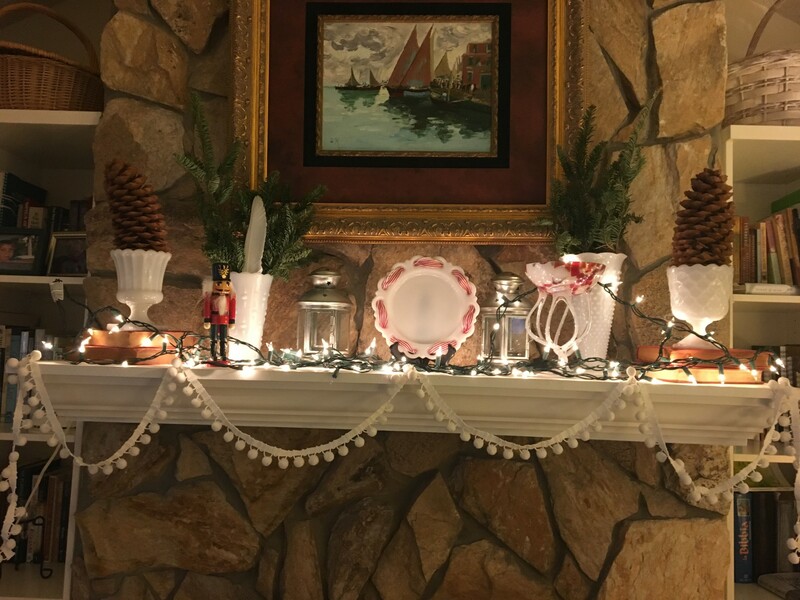 The mantel holds the rest of my milk glass collection. I’ll add the stockings a few days before Christmas. You pass though the opening into the family room. This is where the tree is. I like the couches facing each other. I may just leave the room like this when the tree comes down. I’ll have to see what it looks like with no tree. The couch pillows received a facelift. I sewed these cozy plaid flannel covers for them. The smaller, longer one I made out of an old Madras plaid shirt I’ve had since college days. When the shirt became too ratty to wear, I threw it in my fabric bin. Here are some pictures I took during the day. 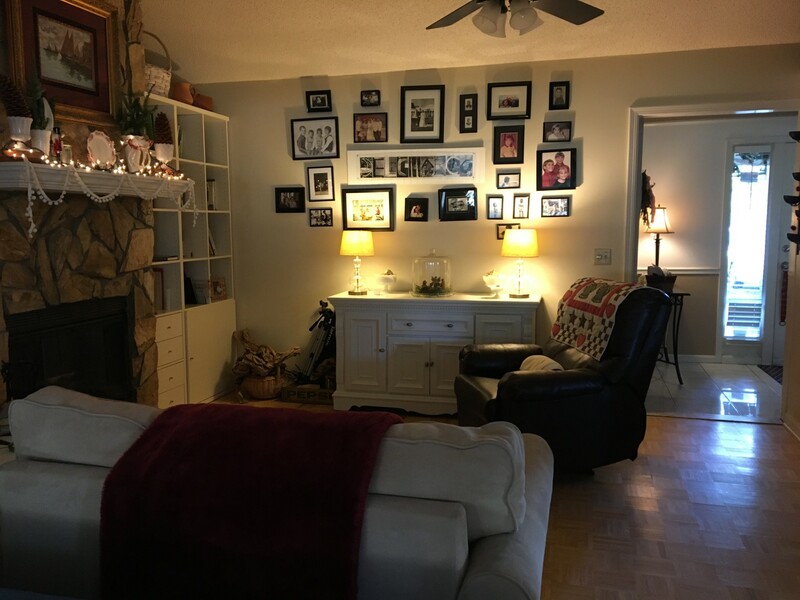 This room gets so much light! The bookcases hold our large nativity that we purchased at a craft fair in Hickory NC about 20 years ago. I love its rustic simplicity. The wise men have not arrived yet. They are still traveling over the hills (of books). The other tower has these two Turkish lantern my dad brought back years ago on one of his trips to Turkey while in the Navy. It also holds the sign I got from Katie from our secret Santa exchange last year! Love it! Passing through the living room you enter the dining room/kitchen area. 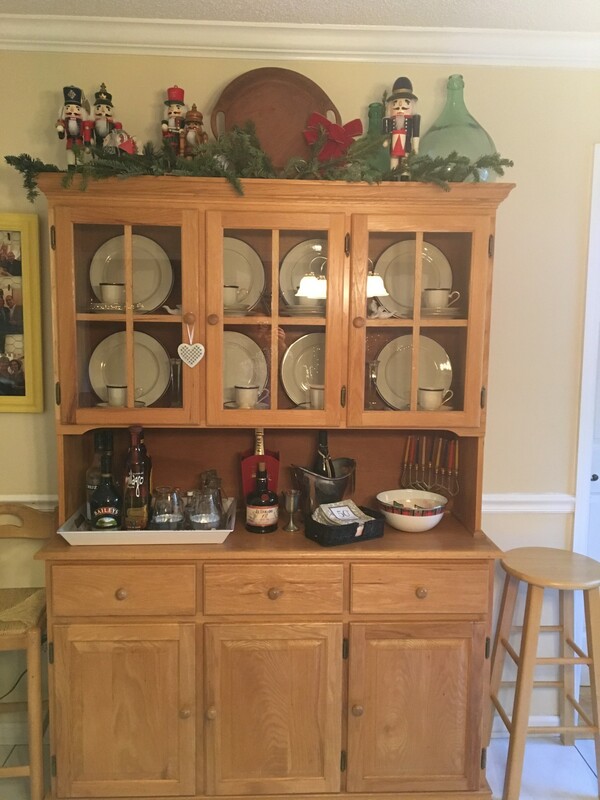 The china cabinet holds our nutcrackers and more fresh pine boughs. The wine bucket is new from one of my sweet students and it’s holding a bottle of our favorite wine from another student. (Cantina Zaccagnini Montepulciano d’Abbruzzo) The sideboard is decorated for the holiday too. 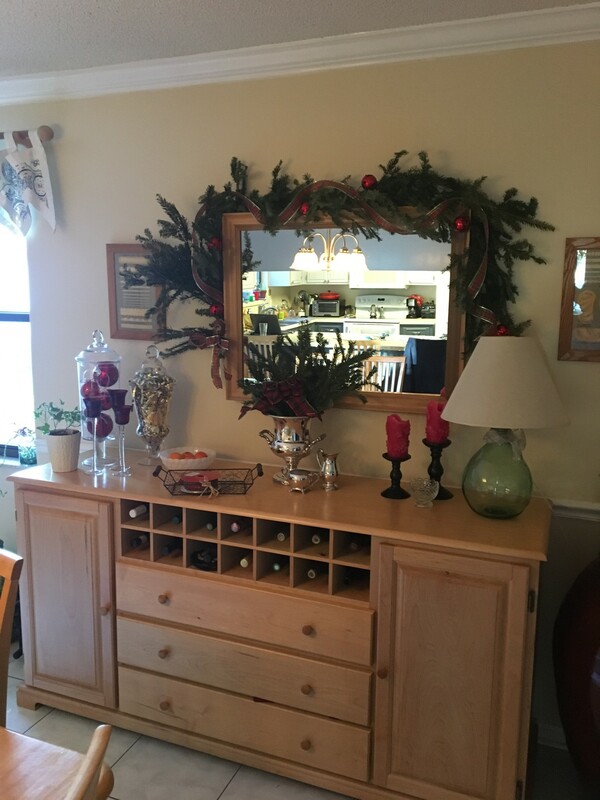 The mirror has a large garland over it with plaid ribbon and red jingle bells that I found at a thrift store this week. I also found the little silver creamer and gave all the silver a good polish. Thanks for visiting with me! Be sure to head on over to Katie’s house to see what she’s done to her place! 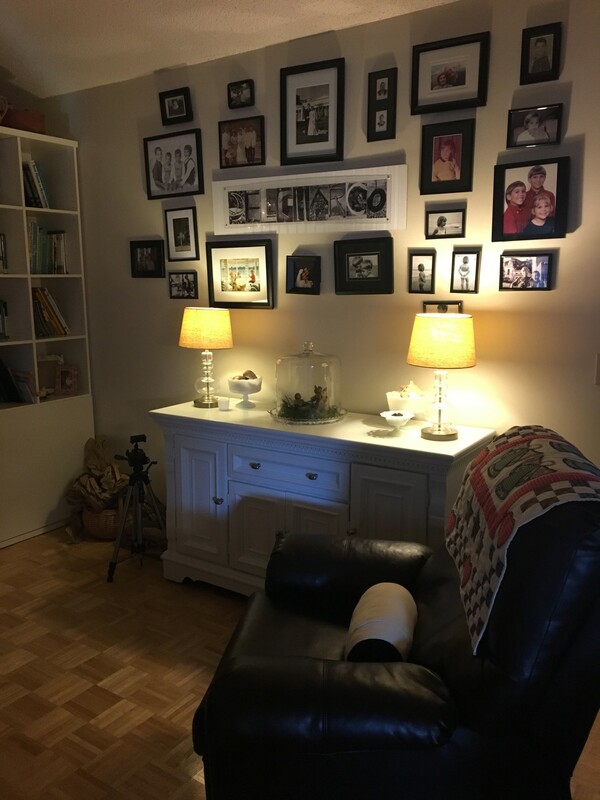 In case you want to see, here’s last year’s home tour. Now that the house it done, I’ve gotta get cracking on the gifts and cards! Just beautiful Sheila! 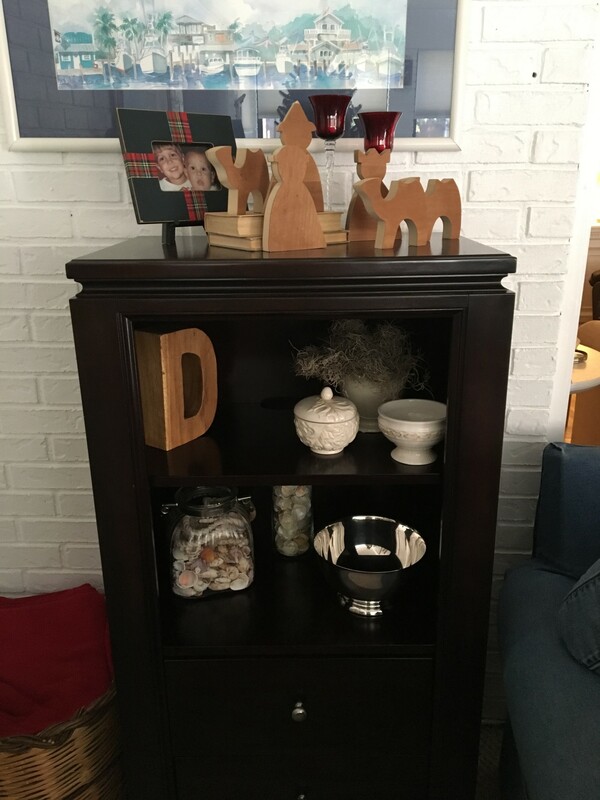 Love that sweet lil nativity and all your darling touches…your home is so cozy and inviting!! Beautiful home Sheila! 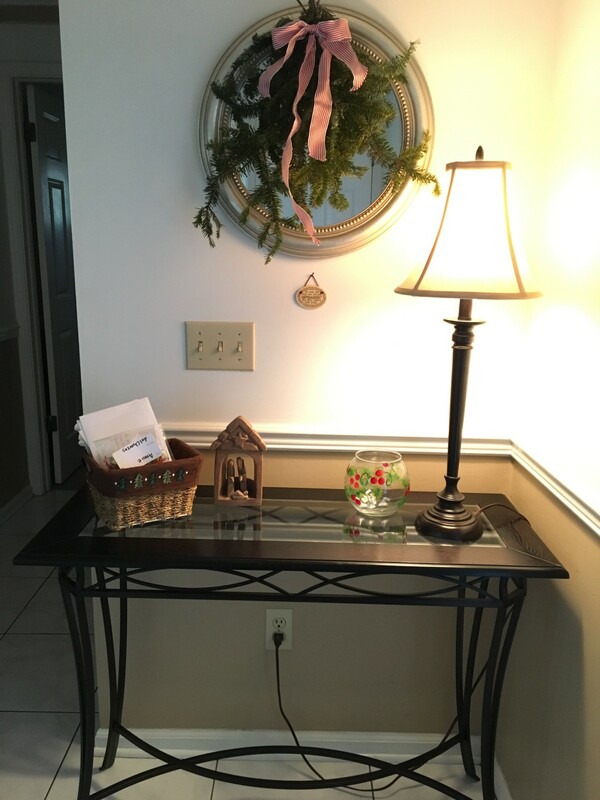 Love your entry way and creative touches. 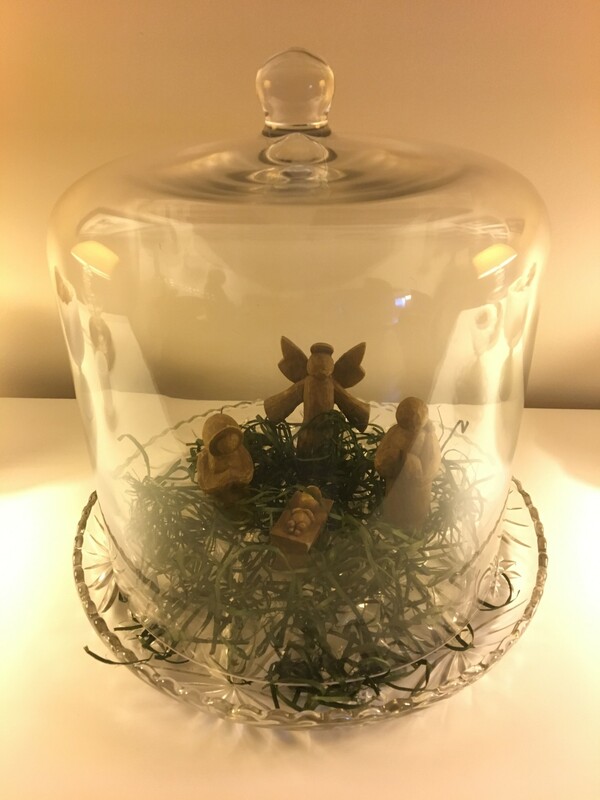 The little nativity under the cake dome is an awesome idea!! Merry Merry!! Cozy and rustic and I love how it is all so cohesive! Beautiful home, Sheila! I think this is my favorite blog hop ever! 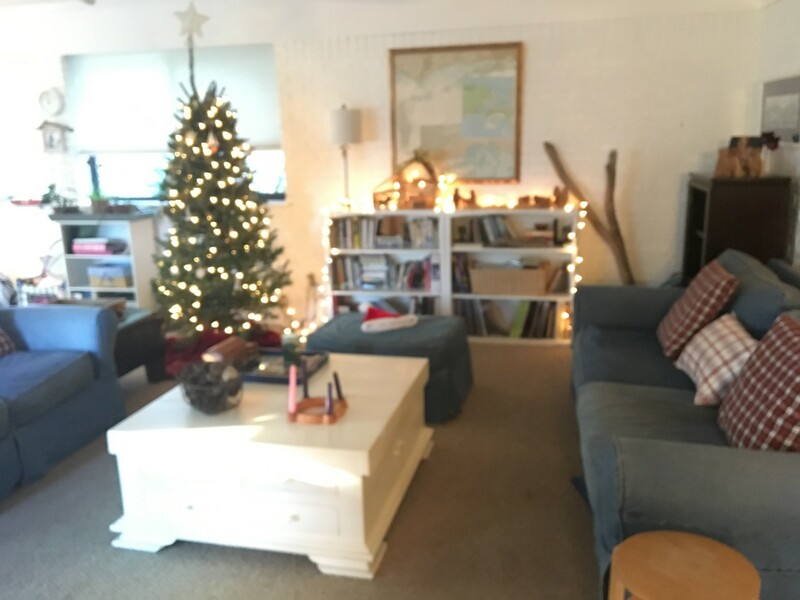 Everyone’s home looks so cozy and festive. It’s making me so happy. I love all the greenery you’ve done at the entrance. I agree. I like this hop! So fun getting to see everyone’s house! Just beautiful! I think the smell of pine is one of my favorites! Love all of your creative touches. Pine smells like Christmas to me! Love it! Thanks for stopping by! Everything is gorgeous, Sheila!!! I love the sofa arrangement! I love all the rustic touches on your home. The white and blue look so pretty and clean for Christmas. Nice milk glass collection. Your front porch is rich and woodsy and I bet it smells great. Loved seeing all your ladies decorated homes, today. Cannot wait to do a tour of my place soon. Thank you Ada! I do like to decorate for Christmas! It’s so fun to look for milk glass when I’m out thrifting! I don’t get everything I find. Just those pieces that speak to me. Thanks for stopping by! You have so many conversation pieces sprinkled about. That chunky wooden nativity scene is so simply elegant. And then, by contrast, the tiny baby manger under the cake glass. Your milk glass…I think my mom has some! The three ceiling fans in your den! Ha! Must get sticky around there in the summer if that’s any indication. And the warm lighting in each room looks like love to me. You certainly have fashioned your house into a home. We have ceiling fans in every room but the kitchen, dining and bathrooms! Even the front porch has one! Yes, it’s so very humid here but a/c cures all. I read A Land Remembered recently which is about Florida in the late 1800s. Can’t imagine what it was like then with the humidity, heat and mosquitos! Ugh! Thanks for visiting! I love the smell of pine – what a fun and aromatic entrance to your house. Your house has so much history with all of your decorations – and your family room looks so cozy with the tree. 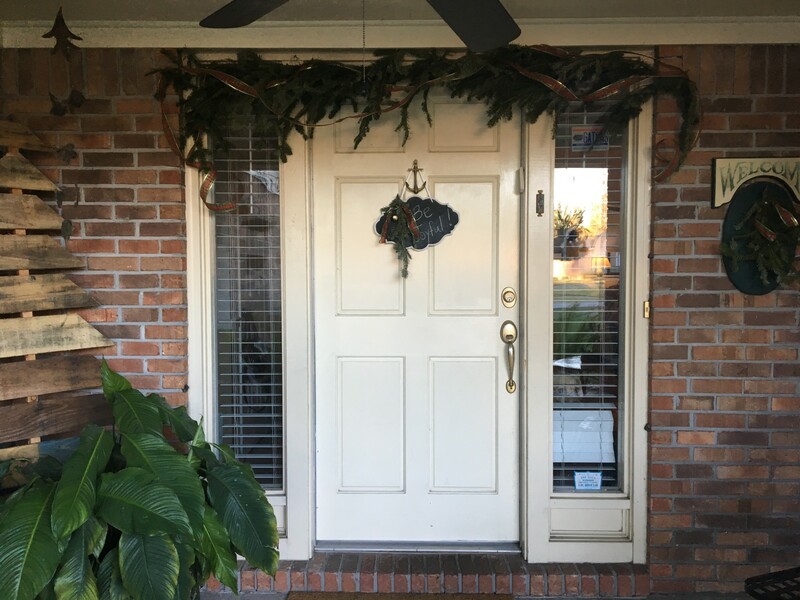 I love fresh garland…I should add some to my front door next year…hmmm…how do you attach yours around your door? 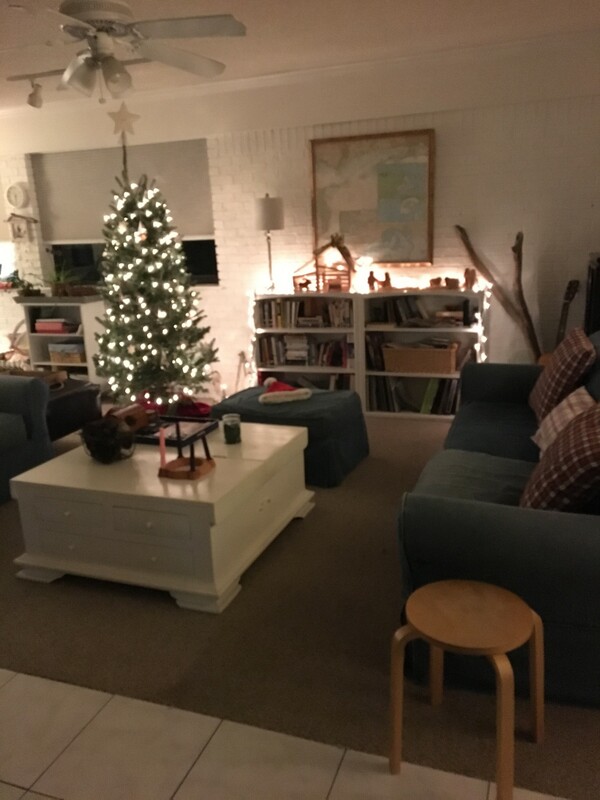 Love all of your decorations and how cozy your house is. 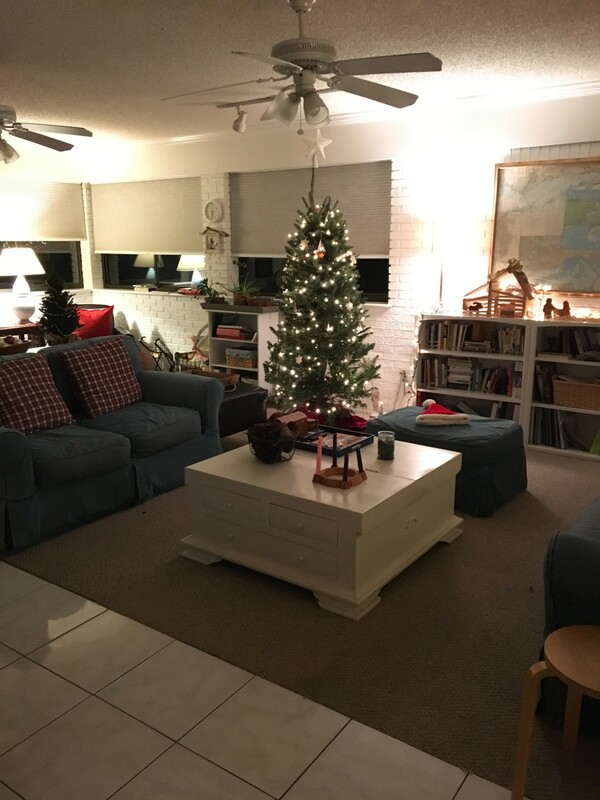 Cozy in Florida for the holiday is how I see your home. Looks so festive, Sheila. I adore that wooden tree outside your front door. Thanks Carrie! It’s definitely a different kind of cozy than our friends to the north! 😉 I love that tree too! Thanks for visiting! Sheila….I really enjoyed your tour. Your tree is so beautiful and I love your mantle with the milk glass. Of course, I have a weakness for those adorable Nutcrackers. Thanks for the inspiration to change things up around my house. Thanks Denise! When I saw your collection of nutcrackers I smiled! Loved your sailor boy! I grew up in the Navy! Dad retired after 30 years! I just love your front porch! That wooden tree is amazing! So simple but makes a statement! I love it too! Loving the pallet wood inspiration on Pinterest! Found a glass business locally that is giving away huge crates or wood. We plan on making lots of reclaimed wood stuff around here soon! Love that nativity scene! What a clever idea to put it under the dome. You reminded me to get out our Nutcrackers. Merry Christmas to you and yours! Thanks Lauren!! That dome is relatively new and I’m having fun styling it in various ways! Merry Christmas back! 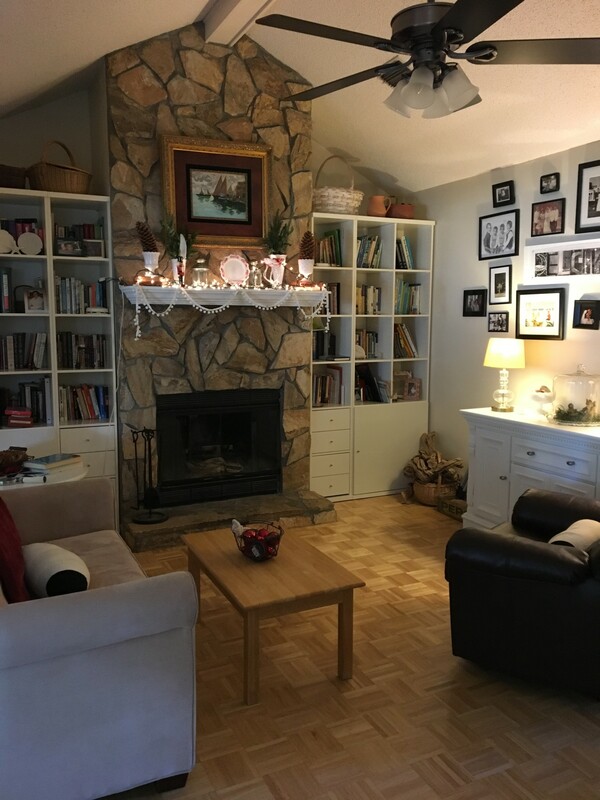 Sheila, I enjoyed touring your beautiful home all decked out for the holidays! I love that pallet tree your dad made, I might copy it. 😉 Your fireplace with the milk glass collection on the mantel is quite a statement, and those nativity sets, adorable. I hope you had a very Merry Christmas and wishing you a fantastic New Year! Thanks for stopping by Cristina! 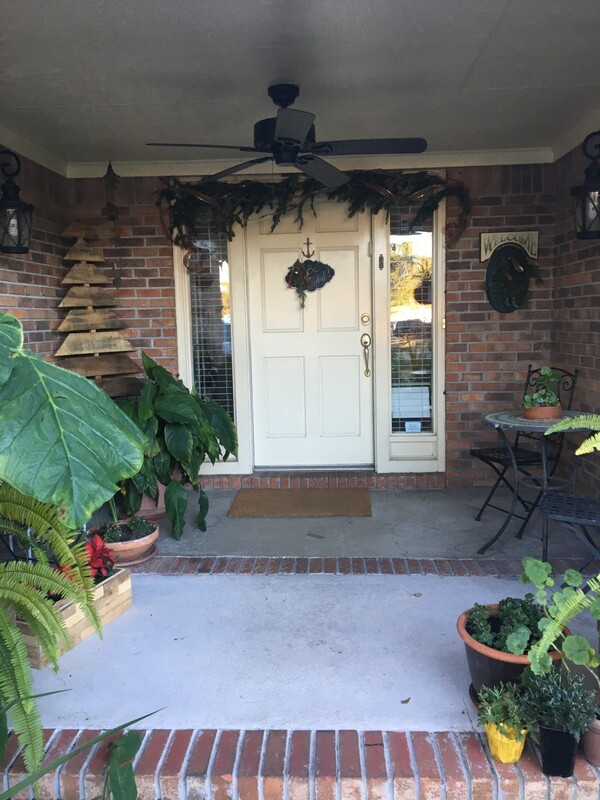 Did you recognize the planters on the front porch?? Yep! Copied from you! So copy away on the pallet tree! ? Happy new year to you and your family!